DigitalGlobe has released a commercial satellite image showing the Fukushima Daiichi reactor complex taken on March 14, 2011. 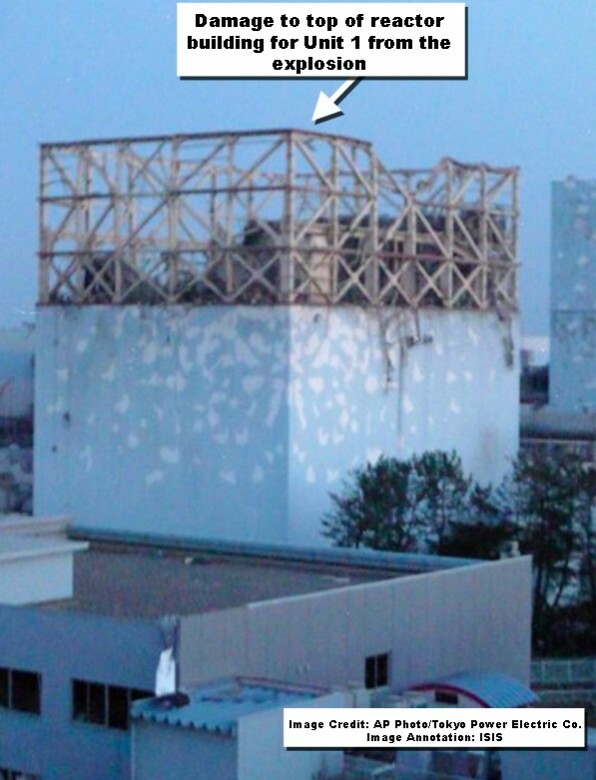 Damage to the top of the reactor building for Unit 1 as well as damage to the reactor building for Unit 3 following the explosions can be seen (see figure 1). Steam can be seen venting out from the reactor building for Unit 3. UPDATE: ISIS has learned that the satellite image in Figure 1 was taken approximately three minutes after the explosion at the reactor building for Unit 3. According to the Tokyo Electric Power Company, the explosion at the reactor building for Unit 3 occurred at approximately 11:01AM local time. According to DigitalGlobe, the image was taken at 11:04 AM local time. Taken so soon after the explosion, the plume seen extending out across the water is likely smoke or dust from the explosion (see figure 1). Figure 2 is a ground photograph of the site, including the reactor building for Units 1 and 3, from September 2010 for reference. Figure 3 is a ground photograph of the reactor building for Unit 1 after the March 12 explosion. 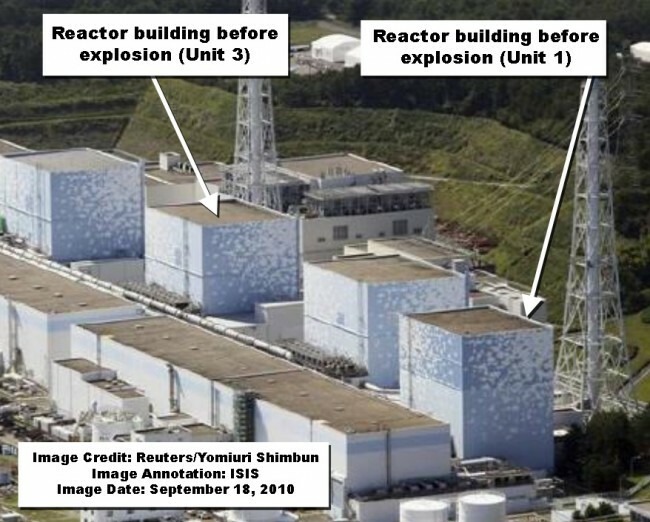 The top portion of the reactor building for Unit 1 is damaged in this image. 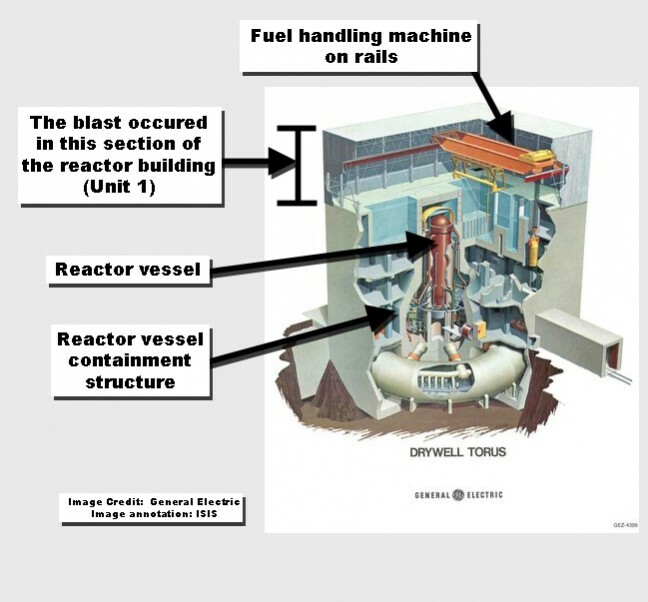 Figure 4 is a schematic from General Electric showing the reactor building for Unit 1 and the top portion where the blast occurred. Figure 1. DigitalGlobe image from March 14, 2011 of the Fukushima Daiichi reactor site. Damage to the reactor buildings for Units 1 and 3 can be seen in this image. 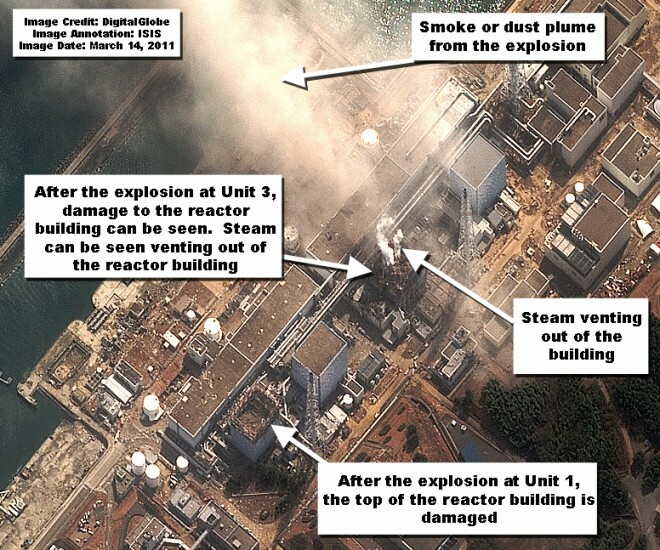 Steam can be seen venting out of the reactor building for Unit 3. Figure 2. A ground photograph of the site from September 2010. The reactor buildings for Units 1 and 3 can be seen. Figure 3. A ground photograph of the reactor building for Unit 1 from after the explosion. The blast occurred in the top portion of the reactor building where the damage can be seen. Figure 4. A schematic image of the reactor building. The blast occurred in the top portion of the reactor building for Unit 1. The orange piece of equipment in this section of the building is a fuel-handling machine on rails. The reactor vessel is in the center of the image, and the containment structure can be seen surrounding it.